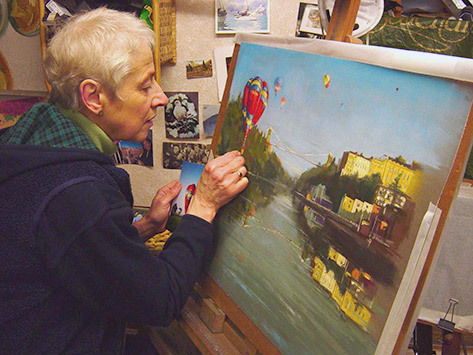 I work mainly in pastel from my studio in the beautiful and historic city of Bristol. The City is famous for its annual International Balloon Festival and of course Clifton Suspension Bridge, Temple Meads Station and the SS Great Britain – Isambard Kingdom Brunel’s great engineering feats. Drawing inspiration from extensive world travel and a love of photography, I try to capture the essential spirit of my many subjects, their portraits and landscapes. Worldwide travels including Australia, New Zealand, USA, Canada, Guatemala, The Ukraine, India, China and Vietnam as well as Europe and the UK. These have provided rich ongoing material for my painting, writing and photography. The Pastel Society and The Society of Women Artists have both displayed my paintings at The Mall Galleries, London and my work has also featured on BBC TV & Radio. My work is available online and locally at the Bristol Harbourside Tourist Information Centre, SS Great Britain and Clifton Suspension Bridge Visitor Centre. I have been invited once more as a guest at the 2019 Hawkesbury Upton Literary Festival to read my children’s books “Worrall and Robin”, exhibiting my art and take workshops. I welcome commissions that can be undertaken from supplied photographs. Have a look at my Commissions page and Contact Me for more information.